I see a stack of rock hyraxes in a cleft of a kokpje. Hyraxes huddle together at night to share body heat, as they have very poor thermoregulation. They also seek shade in the hottest hours as they are vulnerable to overheating if exposed to strong sunlight. It looks like these dassies are seeking a cool spot, but it could also be early morning and they're waiting for the sun to hit the kopje so they can warm up after a cold night. 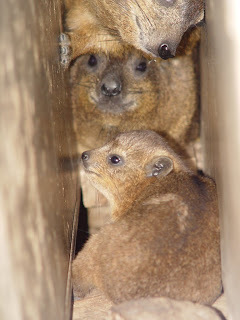 These dassies were resting in a specially built "dassies house" in the Moholoholo Rehabilitation Centre. That's why it was so easy to photograph them!